naturalness of the individual’s speech. Frequency is expressed in percent syllables stuttered and converted to scale scores of 2-18. Duration is timed to the nearest one tenth of a second and converted to scale scores of 2-18. The four types of Physical Concomitants are and converted to scale scores of 0-20. 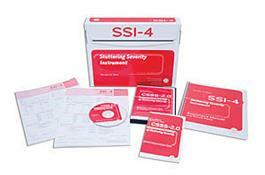 The SSI-4 can also be used in conjunction with the Stuttering Prediction Instruments for Young Children (SPI).